Flax usually does well on types of land suitable for wheat. It grows best on soils with high water-holding capacity and good inherent fertility. However, one disadvantage of heavy soils is their tendency to crust after heavy rains and interfere with the emergence of the seedlings. The use of zero tillage can greatly alleviate this problem. 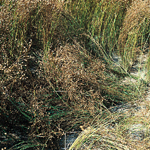 Flax does not thrive on sandy soils unless a large supply of moisture is available. Imperfectly drained soils may result in yellowing and stunting of flax. However, flax will usually outgrow this yellowing. Poorly drained land, or land subject to excessive drought or erosion should not be sown to flax. Flax is moderately tolerant to salinity, provided that fertility levels are suitable and adequate moisture is available during germination. Use good, preferably certified, seed of a recommended variety. Certified seed is tested to ensure minimal weed content, genetic purity and good germination. Certified seed consistently yields better than cleaned seed and produces a higher net return from the crop. If farm-produced seed is used, it should be thoroughly cleaned to remove weed seeds and only sound kernels retained. Reductions in stand must be expected when using untreated, damaged seed. Damaged seed is prone to decay by soil micro-organisms, and the seedlings that do emerge are weak and prone to develop seedling blight. Resulting stands will be poor, uneven, low yielding and lacking in vigour. Seedlings produced from damaged seed may germinate very slowly and may be weak, or show a variety of abnormalities. Common abnormalities include injured root tips, broken or cracked cotyledons, split hypocotyls, twin radicles, radicles trapped inside the seedcoat, and roots that are blunt, broken, long and spindly, or gnarled and distorted. 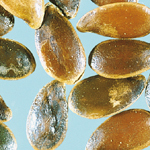 Cracked, split or blighted seed is very common in samples of flax, regardless of where the crop has been produced. 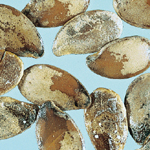 While cracked, split, or blighted seed generally occur together in the same sample, the amount of each varies with weather conditions and farm practices. Seed that may appear sound and whole to the naked eye may, in reality, be cracked when viewed under magnification. Cracks, however small, provide entry for penetration and infection by soil micro-organisms. The amount of cracking varies with year and location and may range from a low percentage to as much as 50% or higher. The seedcoat of flax is fragile, and cracked seed is the result of mechanical damage when flax is threshed at too high a cylinder speed, or when the seed is too dry. Large-seeded varieties are more prone to cracking than small-seeded ones. 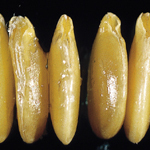 Split seed refers to the condition when the two halves of the seedcoat have become separated at the small end with resultant exposure of the embryo. Splits develop while the seed in the boll is still immature. This abnormality is more prevalent in varieties with a yellow seedcoat (e.g. solin varieties). 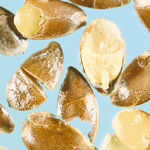 As in cracked seed, split seed is prone to attack by micro-organisms. Splits may be observed with the unaided eye, but the extent of the injury is evident only from inspection under magnification. Blighted seed may be weathered and discoloured, or may be shrivelled. Weathered seed often has a grey, dull cast, and may turn black, while the seedcoat often has a rough texture due to adherence of boll tissue. Weathered seeds tend to adhere to each other in the boll, making threshing difficult at normal cylinder speeds. Shrivelled seed results from diseases such as rust, pasmo, Fusarium wilt, or stem break and browning, which cause premature ripening. Shrivelled seed is often mouldy due to colonization by various saprophytic fungi. Black discoloration may be due to infection by species of Alternaria, or to freezing of immature seed. Frozen seed appears shiny black, as opposed to dull black for blighted seed. Flax must be seeded into moist, firm soil. Seedbed preparation begins in the previous season on either summerfallowed or cropped land. For summerfallow operations, the intent should be to control weeds and preserve the trash cover. For stubble land, the straw from the previous crop should be chopped when threshing, and straw and chaff spread uniformly. applications of 2,4-D or MCPA at low rates. Spring tillage before seeding, whether on summerfallow or on stubble land, should be shallow in order to maintain a firm seedbed, conserve moisture, and avoid bringing weed seeds up into surface soil where they may germinate. If deep tillage is necessary, packing before or after seeding may be required. Sow the flax soon after the land is worked, before the soil dries out and before weed seeds have a chance to germinate. Good post-emergent herbicides have made zero tillage viable for flax. Minimum and zero tillage practices are attractive because they provide protection from erosion, increase soil organic matter and improve moisture retention. In addition, they reduce crusting problems and sun scald, consequently improving stands of flax. Specialized seeding equipment, developed in recent years, is available for these practices. Research at Indian Head, Saskatchewan has shown that flax is well adapted to minimum and zero tillage. In this study, minimum tillage was defined as one pre-seeding tillage operation just prior to seeding while conventional tillage involved one fall and one spring pre-seeding tillage operation. Over the 12 years of the study, flax grown with either zero or minimum tillage out-yielded conventional tillage by 13%. Water use efficiency was also greater with zero and minimum tillage, i.e. more flax seed was produced per unit of water used, even after taking into consideration that zero and minimum tillage will conserve more moisture. Flax should be sown shallow, 2.5 to 4.0 cm (1 to 1.5 in.) deep, with a drill that places the seed at a uniform depth in rows 15 to 20 cm (6 to 8 in.) apart. Recent research has shown that up to 30 cm (12 in.) row spacing in zero tillage is acceptable. Depth of seeding trials at the University of Alberta have shown that seeding depths greater than 3 cm (1.2 in.) result in significant reductions to emergence and yield. The most satisfactory results are achieved by using a drill equipped with press wheels which firm the soil around the seed. If a drill does not have press wheels, a soil packer may be drawn behind the drill, or the field may be packed in a separate operation. The effect of pre-seeding tillage in terms of the type of implement, the depth of tillage and the effect of packing, either before or after seeding, has not been clearly defined. Studies at the University of Alberta have shown that deeper tillage results in poorer stand development but because this practice often leads to extensive tillering, there are not necessarily yield losses. The same effect was noticed with both pre-seeding packing and post-seeding packing. As a general rule, pre-seeding packing was beneficial even to land that also had post-seeding packing. Seeds that are placed at a uniform shallow depth in firm, moist soil will germinate and emerge evenly and rapidly. Under dry soil conditions, it may be necessary to seed deeper than 4 cm (1.5 in.) in order to place the seeds in moist soil. However, deep seeding should be avoided whenever possible as emergence will be delayed, resulting in weak seedlings and reduced stands. Weak seedlings are more prone to injury from preplant incorporated herbicides. Furthermore, deep seeding increases the risk of a poor stand if heavy rain occurs before seedlings emerge and the soil crusts. Flax seedlings are less able to force their way through surface crusts than wheat seedlings. Harrowing, therefore, is occasionally necessary to facilitate emergence of seedlings. If irrigation is practised and the soil is moist, broadcasting the seed followed by a shallow 3 to 4 cm ( 1.2 to 1.5 in.) cultivation and packing has been as successful as normal drilling or air seeding. In general, the seeding rate should be adjusted according to size of seed, germination percentage, soil fertility, or weediness. 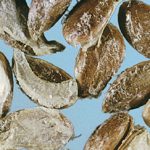 In tests conducted in Saskatchewan and Manitoba, flax showed little yield response to changes in seeding rate from 25 to 55 kg/ha (22 to 49 lb./ac.). A seeding rate of 30 to 45 kg/ha (27 to 40 lb./ac.) is recommended. Higher seeding rates may be required for varieties with a yellow seedcoat (e.g. solin varieties), particularly if seed treatment is not applied. Excessively high seeding rates should be avoided where lodging may be a problem. On land under irrigation, seeding rates as high as 50 kg/ha (45 lb./ac.) can be used. However, if conditions for establishment are good, 33.6 to 39.2 kg/ha (30 to 35 lb./ac.) is adequate if weeds are controlled. With irrigation, plant populations of 300 seedlings/m2 (30/ft.2) are adequate for optimum yield. It is extremely important to choose a variety that has a high level of resistance to lodging, since high soil moisture and fertility generally increase the potential for lodging. A seeding rate of 30 to 45 kg/ha (27 to 40 lb./ac.) results in approximately 500 to 800 seeds/m2 (50 to 80 seeds/ft.2). A seedling emergence rate of 50 to 60% is usually attained under farm conditions. According to Manitoba Crop Insurance, yields are not significantly affected by reduction in plant stands from 400 to 300 plants/m2 (40 to 30/ft.2), but yields generally tend to drop off as stands drop below 300 plants/m2 (30/ft.2). However, even at plant stands as low as 100 plants/m2 (10/ft.2), yields were reduced only about 20%, as extensive tillering compensated for the lower stands. If seedling stands are thin, a decision must be made whether to reseed or not. Flax seedling emergence is sometimes poor due to damaged seed, soil crusting, seedling diseases, adverse weather conditions, deep seeding, herbicide injury, or other reasons. Generally, yields are lower the later the seeding date, and lower because of loss of soil moisture from additional tillage. The added costs of reseeding must also be taken into account. Early seeding of flax generally produces the best results, for flax is seldom damaged by light spring frosts. Plants just emerging are the most tender, but can withstand temperatures down to approximately -3°C (27°F). After the seedlings have passed the two-leaf stage and are hardened by exposure, they can withstand temperatures as low as -8°C (18°F) for a short time without damage. Unlike cereals, where the growing point of the seedling is protected under the soil surface, the growing point of the flax seedling is fully exposed above the ground and is more vulnerable to frost. Moderate temperatures and ample soil moisture during flowering and seed development favour high yield, high oil content and high oil quality. Such conditions are more likely to occur with early seeding. As well, seeding in mid-May generally results in somewhat less lodging. High quality straw for fibre is also more likely to be obtained when flax is seeded early. Late seeding of flax often results in much lower yields. Tests in Manitoba showed that compared to early seeding in May, a delay of seeding to June 1, June 10 and June 20 resulted in respective yield reductions of 7%, 29% and 52%. Late seeding also reduces oil content and seed size. Because green stems and second growth are more prevalent in a late-seeded crop, harvesting is more difficult. However, a delay in seeding of flax may be necessary if herbicides are not used to control early starting weeds such as wild oats, or when drought or excessive moisture have delayed field work. When seeding is delayed until after June 1, only early maturing varieties are recommended because of the risk of fall frosts. Flax varieties differ in their performance under conditions of late seeding. Flax is an excellent crop for irrigated crop rotation since it is not prone to Sclerotinia stem rot which affects canola, sunflower, peas, and beans. The major effect of irrigation on flax is to promote a second or third flush of flowers and to maintain adequate moisture for plant growth until all flowers have developed seeds. In non-restricting soils (medium-textured soils that are amenable to lots of moisture), flax develops a short, branched taproot, encompassing a rooting zone of 1 m (39 in.). Root development is nearly completed by the flowering stage. On irrigated land, flax takes approximately 70% of its water requirement from the top half of the root zone. Over the growing season, crop water use may be as high as 41 cm (16 in.). During the seedling stage, water use will range from 1 to 3 mm/day (0.04 to 0.12 in./day), rising to a high of 7 mm/day (0.28 in./day) during the flowering stage. The critical water requirement period for flax is from flowering to just prior to seed ripening. Therefore, to maximize yield and oil content, adequate soil moisture must be maintained during that period. Monitoring moisture use by soil moisture sensors, crop water use models, or direct measurement of crop use, is important if adequate soil moisture is to be maintained. However, the last irrigation of flax should be completed by the second week in August to ensure that the seeds ripen. Extending the last irrigation past this time will encourage continued growth in the crop, increasing the potential for frost damage and a delayed harvest. It may be necessary to irrigate in the spring for the crop to germinate. Unless soils are very heavy, a light irrigation of 15 to 20 mm (0.6 to 0.8 in.) prior to seeding is preferred to irrigation after seeding which can cause crusting and cooling of the soil.